Tax Practitioner Institute (TPI), is a one-day program focused on the practical application of Federal and Maine tax rules and updates in the tax law. The program this year will cover the Tax Cuts and Jobs Act of 2018. TPI is a primer for newer practitioners and a refresher for the more experienced. 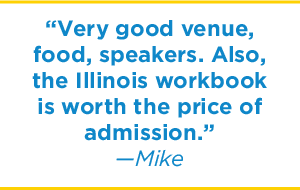 Every attendee will receive the most recent University Of Illinois Federal Tax Workbook. All TPI presenters are Maine-based experts who have relevant experience in tax return preparation, and many will highlight hands-on examples from the Federal Tax Workbook. TPI is offered at three different locations for your convenience: Portland, Augusta and Brewer. TPI is approved as a provider for continuing education credits by the Maine Board of Overseers of the Bar, the Maine Board of Accountancy and the IRS. If you prefer not to register online, please download the Registration Form, and mail it along with your check. The fillable form can be completed before printing. The registration fee is $185 for each registrant. Fee includes tuition, University of Illinois Federal Tax Workbook, refreshments, lunch and CE certificates. To ensure availability of seating, please register by October 15, 2018.